7075 aluminum alloy plate has been the standard workhorse 7XXX series alloy within the aerospace industry. Zinc is the primary alloying element in 7075 and was the first successful Al-Zn-Mg-Cu high strength alloy using the beneficial effects of the alloying addition of chromium to develop good stress-corrosion cracking resistance in sheet products. Although other 7XXX alloys have since been developed, 7075 aluminum alloy plate remains the baseline with a good balance of properties required for aerospace applications and excellent machinability. This aluminum plate is made of one of the strongest of the aluminum alloys. Its use parallels that of 2024, with 7075 selected when higher mechanical properties are desired. 7075 aluminum is an aluminum-zinc alloy with 1%-8% zinc in addition to small amounts of magnesium and small quantities of copper and chromium. This alloy is precipitation hardened to very high strength levels. 7075 is one of the highest strength aluminum alloys available. Its strength-to-weight ratio is excellent, and is ideally used for highly stressed parts. It can be formed in the annealed condition and subsequently heat treated. 7075 is comparatively tough for an aluminum alloy. As such, it produces greater springback during forming operations. If forming difficulty is encountered in the annealed condition, then warming the material to 200°-250°F will assist formability. 7075 alloy is capable of high-strength as developed by heat treating. It also has excellent properties at low temperatures. Its electrical conductivity is 36% of copper. 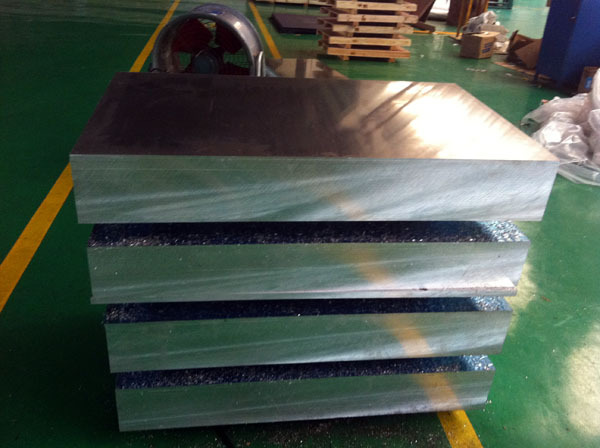 Due to its high strength-to-weight ratio, 7075 Aluminum Plate is used for highly stressed structural parts. Applications include aircraft fittings, fuse parts, meter gears, missile parts, regulating valve parts, worm gears, keys, and various other commercial aircraft, aerospace and defense equipment and components. It has found usage as a mold material, especially in the plastics industry.